The following adverts were published in the Newcastle West newspaper the Weekly Observer in the 1921. They show advertisements for companies based in Limerick city. The Weekly Observer was founded before 1913. In the 1920s the editor of the Weekly Observer was a newsagent John “Sean” Brouder. In 1911, John was living on Maiden Street, Newcastle West with his sister Catherine Brouder and aunt Anne Davis. He was recorded as a 22 year old farmer and journalist. The first two adverts are for fashion the Crescent Emporium and Tylers shoes. 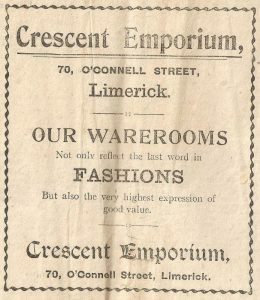 The Crescent Emporium opened on April 7, 1914 at 70 O’Connell Street. It was owned by James J. O’Dea. It closed when his wife Lily retired in 1935 due to ill health. Lilly passed away in 1945. James passed away in 1954 aged 70 years. J R Tyler & Sons opened in Leicester, England in 1817 and closed in 1979. It had stores at 140 O’Connell Street (George Street) and 25 William Street, Limerick. 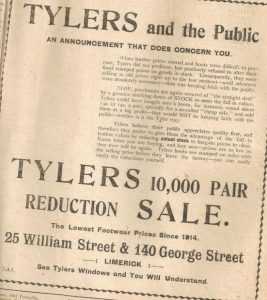 In 1970 Tyler’s sponsored a modelling competition where the winners would receive among the other prizes a wardrobe of shoes. In 1986, Benson shoe purchased the business and its 61 stores were incorporated under the Discount Shoe Zone brand from 1996. Although cars were new to the streets in 1921, there were a number of garages in the city including Lawlor Bros of 22 Catherine Street. 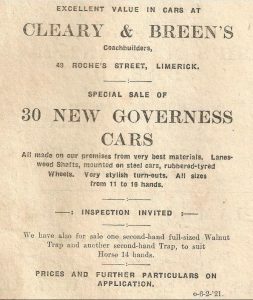 There were also horse powered cars on sale at Cleary & Breen’s coach builders. 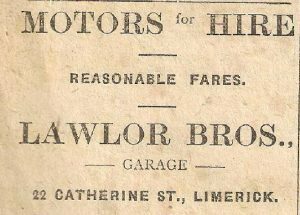 Lawlor Bros ran their garage on Catherine Street from at least 1918. The brothers were Francis and Martin. In 1911, Francis was a reporter while Martin was an fitter with the Great Western and Southern Railway Company. In the 1920s, Cleary & Breen, would carryout public tours to Kilkee at a cost of 16 shillings for a return ticket. In 1943 the company was renamed Breen & Son operating out of Newcastle West as their branch in 49 Roches Street, Limerick had closed that same year. 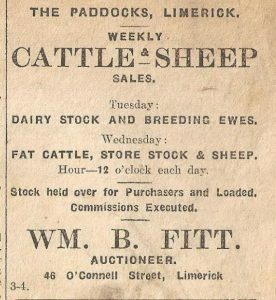 The final two adverts are for the livestock businesses which were thriving in Limerick in the 1920s. 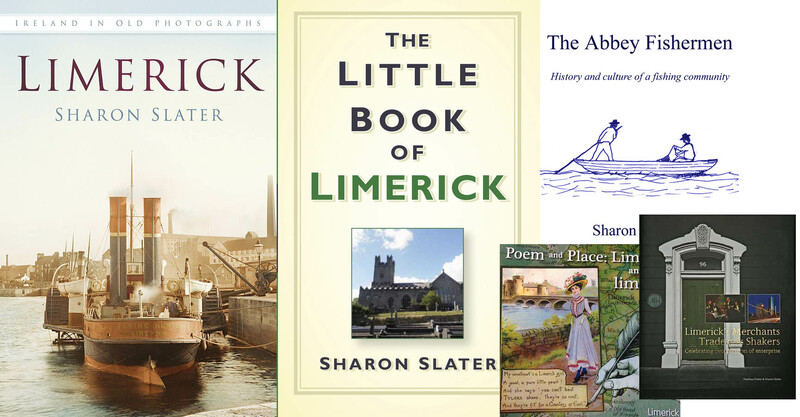 These included O’Mara’s bacon factory and William B Fitt’s auctioneers. 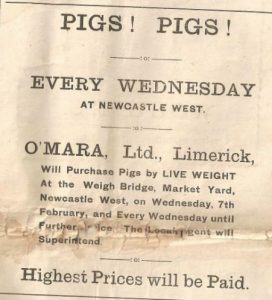 It is interesting to note that O’Mara’s bacon factory would send employees out to Newcastle West to purchase pigs for their factory. William Fitt’s Auctioneers operated out of 46 O’Connell Street from at least 1886. William B Fitt died in 1945 and was buried in the Quaker Cemetery in Ballinacurra.